The president and the chancellor of the University of Missouri have resigned due to pressure from students over three or four unconnected campus incidents that have been characterized as racist. Now students across the country are up in arms, protesting university leadership and demanding changes to the college and financial systems of the United States. There’s no easy way to put this, so I have to say it straight out: nobody who supports trigger warnings, complains about microaggressions, or demands a “safe space” free of disagreement will ever achieve greatness in any field of endeavor worth mentioning. And yet the American college system is where such concepts are birthed, promulgated, and put into practice. What these young revolutionaries are demanding is destructive and poorly thought out at best. Lacking ideas, lacking the work ethic and accomplishments and education of the people they seek to destroy, what they’ll replace the current system with is unworkable. Granted, the current system is absolutely terrible, with overpaid professors filling young skulls with rancid, politicized custard from a bully pulpit, but it’s better than forgiving all student loan debt, demanding free public college education, and upping the federal minimum wage to an arbitrary $15.00/hour. That doesn’t just affect colleges: it affects everybody, and it’s not possible to implement. Joshi correctly made the point that the outrage over Lovecraft’s racism is selective, at best: John W. Campbell and Bram Stoker were also racists, yet still have awards named after them. Why? 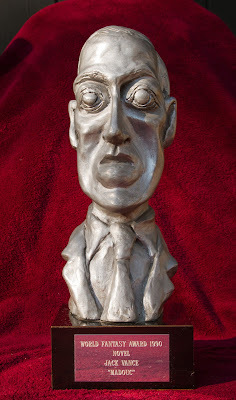 Like the protesting college students, not one of the people supporting the removal of Lovecraft’s image from the World Fantasy Award will ever achieve greatness. None of them will ever have the same effect on genre fiction that Lovecraft had. They’re destroyers, not creators, and what they’ll put in place of what they’ve torn down is without value.